I've been following a lot more crafty people and companies on Facebook recently, its nice to have a little crafty injection when I manage a 2 minute break at work to refresh facebook. 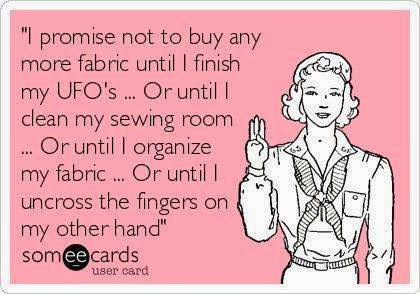 Somehow my fingers manage to make their way to that new book or that new pile of fabric or just maneuver my car into the car park at the local craft shop...I surely cannot be blamed for these incidents over which I have little control? I'm 120 rows in....yes really 120 rows I had to count twice....but I'm not finished. I don't really know how many rows I'm planning but is isn't quite long enough so I'm still going. tree trunk done...now just the 80ish flower pieces to go! Ok, so now I've admitted to my 2 mammoth ongoing projects is it a good time to admit I'm starting another one?? I will also point out right now that I have just joined the Quilty Fun Sew Along being ran by Lori Holt and a raft of quilty bloggers so yes I'm about to start something new....oh well it's the thought that counts right??? This runs right until March 2014!